We like to play around with materials and products, and no where do we play around more than in our bathrooms. Old antiques as vanities, old porch ceilings as wainscotting, cool tile, old windows for mirrors and neat fixtures. 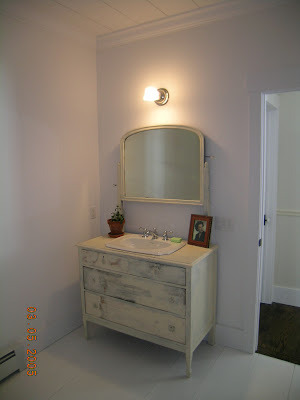 We installed this distressed vanity and mirror in Farmhouse 4, a house way up on the hill in North Branch. Michael and Andy bought this house in the summer of 2005. 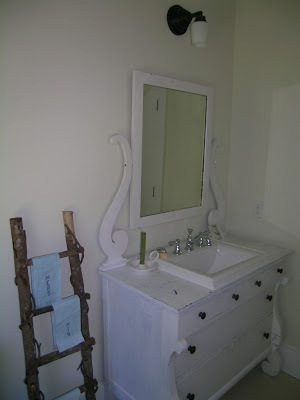 This unique piece was installed in the guest bathroom at Farmhouse 5, purchased by Paul and Dukhui in October of 2005. 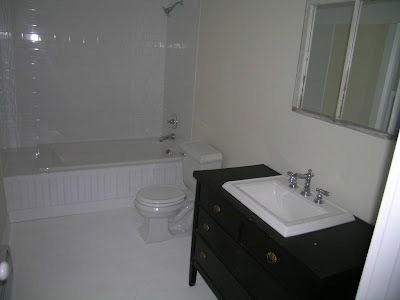 The photo above is the bathroom in Farmhouse 7, owned by Andrew and Robin. This house is located in Barryville, NY. 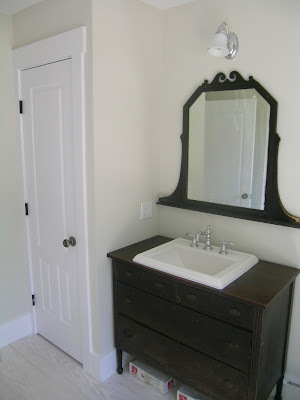 Beadboard wainscotting around the tub and an antique dresser for the vanity. Great to wash their 2 yr old after a day out in the dirt. A dark dresser, white sink and white pickled floors. The rounded mirror really sets this one off. Frank, Ellen and their 2 children enjoy this beauty in the master bathroom.